Last year's Rookie of the Year Shohei Ohtani faced off against next year's potential Rookie of the Year Vladimir Guerrero Jr., who at 19 years old drives balls out of the park like his dad but unlike his dad never swings at pitches out of the end zone. Learn to play Statis-Pro Baseball in 5 minutes by clicking here. 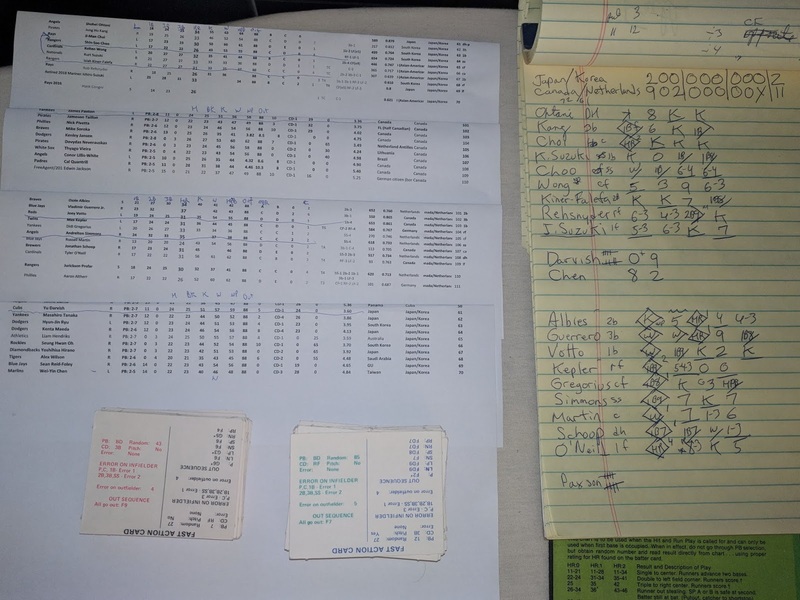 He did not disappoint, drawing walks his first two trips and then blasting a home run the first time he saw something in the strike zone as the Canadian/Netherlands team blasted the Japanese/Korea team 11-2 to start play in the six-team international Statis-Pro league. Below is the play-by-play alongside the actual Statis-Pro cards based on projected 2019 stats, but listed in row form (from top to bottom, Japanese batters, Canadian pitchers, Canadian batters, and finally Japanese pitchers). We do throw in the Netherlands Antilles to give the Netherlands the reach of their old kingdom into the Caribean as well. Canada did have a great advantage in this matchup because their starting pitcher James Paxton was a lefthanded PB2-8 for his projected 3.36 Pure ERA (based on expected ERA if a pitcher had average fielding and ballpark behind him). Facing the left-handed heavy hitting Japan/Korea team Paxson had a huge advantage. While the Netherlands and Canada are thousands of miles from each other, we grouped them and a few other European players who were born closer to the North Pole than the equator (both countries reach above the 51 North Degree Latitude. The Canadians are balanced with both their starting rotation ERA (3.97) and starting line-ups OPS (0.770) both falling in fourth place of six teams - but in both cases just a few points behind third place. Obviously Venezuela is at a disadvantage in this opening series as they are projected as the 2nd best team but facing the favored Dominican Republic in their first series.